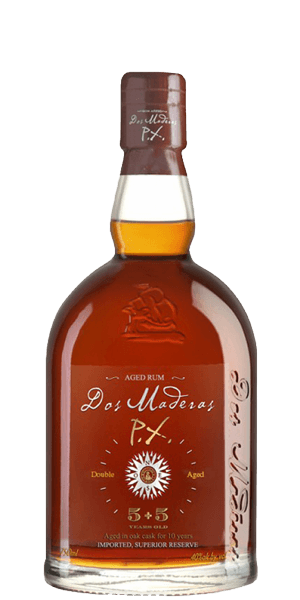 Dos Maderas PX 5YO + 5YO, a triple aged Rum, originates from aged Rum stocks of Barbados and Guyana. It is aged in three steps. First for 5 years in the Carribean in American oak casks, then 3 years in the Spanish facilities of Bodegas Williams & Humbert in their sherry casks which previously held "Dos Cortados" Palo Cortado Sherry. And finally, aged for another 2 years in casks used for the 20 years old "Don Guido" Pedro Ximénez Sherry. This is a very unique process for Rum production, which brings a new taste profile, a "Sherried Rum". All this aging brought Dos Maderas PX 5YO + 5 YO a Gold Award at the RumXP competition. What does Dos Maderas PX 5YO + 5YO Rum taste like? The Flavour Spiral™ shows the most common flavours that you'll taste in Dos Maderas PX 5YO + 5YO Rum and gives you a chance to have a taste of it before actually tasting it. Very interesting exercise. A Sherry sensation. This is my second favorite tum, to date. My favorite is Pyrat Cask 1623. I can't wait to try Dos Maderas Luxus. This rum is on the dry side of sweet, with some current and date notes along with caramel and vanilla. It is one of the more complex aged rums on the market. More complex than most runs, and not as sweet. Almost whiskey-like. Can’t wait to purchase the full bottle! I wish there was a bit more spice to balance out the creaminess. Familiar nose and taste of aged rum and the finish is so interesting I kept sipping more and more. IT is a classic, balanced, triple aged Rum, originates from aged Rum stocks of Barbados & Guyana. with a Sherry Cask finish. Smooth with great flavor !! If you like dark rum, you will love it. We love it straight or with a splash of coke. Initial impression is a quality spirit that will pair nicely with a warm breeze and a fine cigar. Has a fruity sweet with a slight spice nose. The hint of sherry and banana lingers nicely. Easily my favorite aged rum, a little sweeter than others but very good and lots of flavor. I had a banana that wasn't there. Nice one. Very unspecisl in a good way. Nice to have. One of my absolute favorite rums! Wonderful! Great sherry aroma. Light & smooth. I brought this bottle to a party once. She was in a good company of some fine whiskies and really good rums. But somehow, everyone who tried dos maderas stayed with dos maderas and after 45 minutes it was empty. Good stuff! Super Easy to fall in love with.